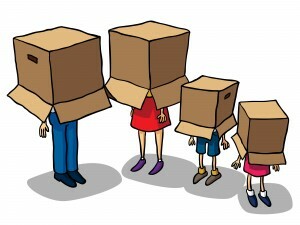 Are You Outside of the Box or Boxed In? The fast food industry is a competitive marketplace in which everyone tries to outdo the competitor. A more fabulous burger; a fresher bun, a new twist on the salad, a different sauce for chicken nuggets, and nutrition information on boxes. On the surface it all looks innovative. It looks as though a new path is really being taken. But dissect it and you’ll find there’s nothing new. In fact, it’s all very old. Take fast food packaging for instance. Packaging hamburgers has changed little since McDonald’s opened its doors in California in 1940. Wrapping up a hamburger like a Christmas gift might make it look nice but it hampers the functionality, especially in view of the statistics: Most sales at fast food restaurants are through the drive-thru window. Which means most people are eating the food in their cars, fumbling with hamburger wrap that offers nothing in the way of food containment. And what happens to all that pretty wrapping once the eating is over? It gets tossed, in the garbage or ends up on a street corner. It’s a fact that most fast food wrap is harmful to the environment and if you want further proof, consider: The Dogwood Alliance released a report that targets what the Alliance calls the destructive legacy of fast food packaging. The group is calling on fast food restaurants to increase the use of recycled paper in its packaging and to stop buying paper packaging that originates from endangered forests in the Southern U.S.
GreenDustries’ products are green and certified right down to our sales material, which is approved by the Forest Stewardship Council (FSC), an independent, non-governmental, not-for-profit organization established to promote the responsible management of the world’s forests. The FSC is widely regarded as one of the most important initiatives of the last decade to promote responsible forest management worldwide. To receive certification from the FSC, a company is required to utilize paper products that are at least 10 percent recycled. GreenDustries carries this out to a very strict conclusion: All of our business cards and sales brochures, stationary, and folders are made from recycled materials and as such, have all received FSC certification. GreenDustries is also endorsed by the Dogwood Alliance. Having such recognition has helped our mission, but our philosophy is not to push green or appear as fanatics – that would make us less credible. Green to us is a business lifestyle. So in our quest to do something great for both the environment and the consumer, we need to ask: If you want to be an innovator in packaging why go to the same people who gave you something as non-functional as the hamburger box? 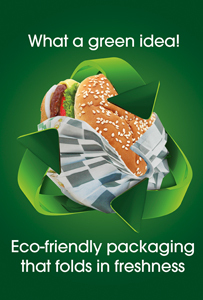 GreenDustries believes in functional fast food packaging. We also believe that you can’t correct the problem with the same thought pattern that created it. Thinking outside the box means getting rid of the box. Thanks for your publication. What I want to comment on is that when looking for a good on-line electronics go shopping, look for a website with complete information on critical factors such as the security statement, safety details, payment methods, along with other terms along with policies. Usually take time to see the help and FAQ areas to get a superior idea of how a shop functions, what they are able to do for you, and just how you can use the features. Ist It Green? or Greenwashed?